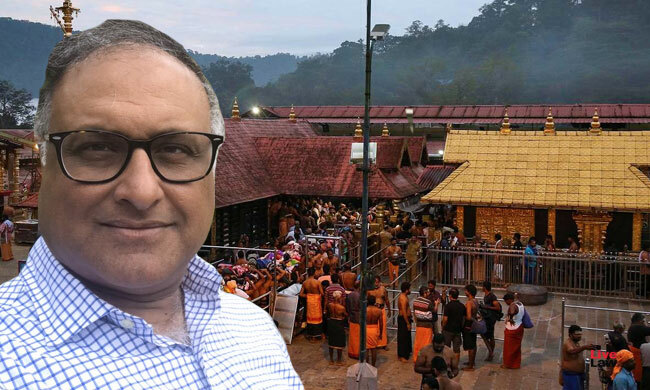 Opposing close to 60 pleas seeking a review of the 2018 Sabarimala verdict, Senior Advocate Jaideep Gupta, for the state of Kerala, argued, "Nothing has been placed before Your Lordships that would justify a review. If a substantial case were to be made, we will make exhaustive arguments"
"The overriding thing is that there was a consensus of Your Lordships (in the majority judgment) on three issues. Firstly, under Article 26, it is not a denominational temple. The devotees of Lord Ayyappa are not a denomination but a general body of Hindus. Anybody can go and visit the Temple. Secondly, Excluding a person till the age of 50 is an exclusion for a major portion of the life of the person. Finally, Rule 3(b) [of the Kerala Hindu Places of Worship (Authorisation of Entry) Rules] is violative of section 4 of the 1965 Act itself, besides article 25(2)(b)"
"A challenge on the ground that Articles 15 or 17 were not considered will not have an effect on the judgment so far as these three go. The mandamus will remain. Unless it is proved that a consideration of the same would affect the three points of consensus, there should be no review...", Mr. Gupta countered the arguments of the review petitioners. "They have analysed the judgments (the impugned judgments) in great depth and pointed out the inconsistencies between the different judgments. This can't be a job of the review court", he advanced. "Non-consideration of the arguments is not a ground of review at all. It is for Your Lordships to decide which arguments are essential to be for the disposal of a matter. It can't be a complaint and definitely not an error apparent on the face of the matter", he continued. Relying on a 1997 apex court ruling, Mr. Gupta submitted that if a convoluted process of reasoning is required to challenge a finding, then it is not an error of law apparent on the face of it. "Mr. Parasaran (Senior Counsel K. Parasaran) was speaking of Article 17. It may or may not be the central aspect here as not all of you pronounced a decision in that behalf. Similarly, Article 15 does not affect the point on which the three majority judgments reached consensus. "The 'Thanthri' (represented by Senior Advocate V. Giri) has re-argued the interpretation of section 3 [of the Kerala Hindu Places of Worship (Authorisation of Entry) Act of 1965]. There is a tendency to confuse essential practices of a religion with the essential practices of a temple.Essential Practice of a temple is not the essential practice of religion. The constitutional issue is that whether it is protected under Article 25 and a essential practice of the Hindu religion- No! Because there are any number of temples where the practice is not followed. In fact, We are only aware of one such temple. 25 not affected. The Essentiality doctrine was applied in the Shirur Mutt case as well as all cases henceforth to a religion as a whole and not to a temple...", contended Mr. Gupta. "If it was held to be a denominational temple (Nobody has challenged the decision on Article 26 here, he commented), then the question of the Essential Practice of this temple could arise...If Your Lordships are required to go into the essential practices of temples one by one, there is sufficient uniqueness in each of them. The doctrine would be demolished! The Jagannath temple is extremely unique, so is the Kashi Vishwanath temple. Nobody can underestimate the importance of the Tirupati temple. But none of these have been held to be denominational. On the hand, the Shirur Mutt, as a group that organises a temple and possesses identifying characteristics, is a denomination...", he elaborated. "(Senior Counsel Shekhar Naphade) said this is a private law matter. But it concerns a public temple! There is a kerala act that deals with it. The Kerala act envisages it to be laid open to all classes of Hindus without exception. Unless someone argues that the Ayyappa devotees are not a class of hindus, rule 3 violates section 4. If a religious practice violates a constitutional ideal, it has to go. Yes, Religious practices are not typically to be overruled. But the event of a conflict with the fundamental aspects of the constitution is an exception. Your Lordships have relied on Article 13 that says that even a custom is subject to fundamental rights", Mr. Gupta sought to demolish the claims of the other side. "Non-discrimination and non-exclusion are principles that override everything. In Venkataramana Devaruand (1957), in harmonising Article 26 with Article 25(2)(b), Your Lordships have said that every practice of the temple will be protected under 25 except that which affects the right of entry. Entry has been regarded as higher than anything else!" "It was argued that on account of the judgment, Social peace has been destroyed. This is not something which should concern a constitutional court. Peace will prevail ultimately. But a constitutional breach cannot be allowed till that time!" Earlier, Senior Advocate R. Venkataramani had dealt with 'Samprayadayas' in the light of Article 26- "Within the Vaishno sampradaya, there are several sects with subtle differences. The Court cannot not undertake an inquiry into a Sampradaya. If sabarimala is a sampradaya and I believe in it, then I must abide by its practices. Otherwise, I am not a part of it...The reason and the process of the court in entertaining the petitions (challenging the restriction on entry) flies in the face of the Sampradaya!" "A Sampradaya is not protected under the constitution. What is protected is denomination and the essential practices of hinduism! ", concluded Mr. Gupta.